This account is taken from University of Michigan Animal Diversity Web and Kruuk (1995). The photograph was kindly supplied by MPhil, and taken at Pulau Ubin, Singapore in July 2004. Click on it for a better resolution version. 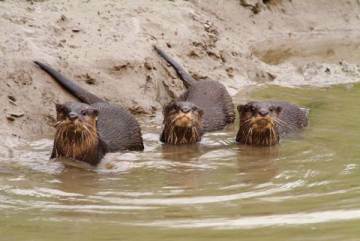 Small-Clawed Otters make use of a wide range of habitat - small streams, ponds, shallow river margins, rice paddies, drainage ditches, marshes, around lakes, swamps, coastal mangroves and along sea shores. They are found in mountainous areas in the Himalayas, and tropical forests in Indonesia. Their basic requirements are permanent bodies of water, with shallows, and with some trees and other vegetation. Within a territory, the otters establish fixed places for getting in and out of the water, sunbathing, grooming, and spraint sites, preferably on large flat rocks high up. They tend to follow fixed routes, and wear paths in vegetation. 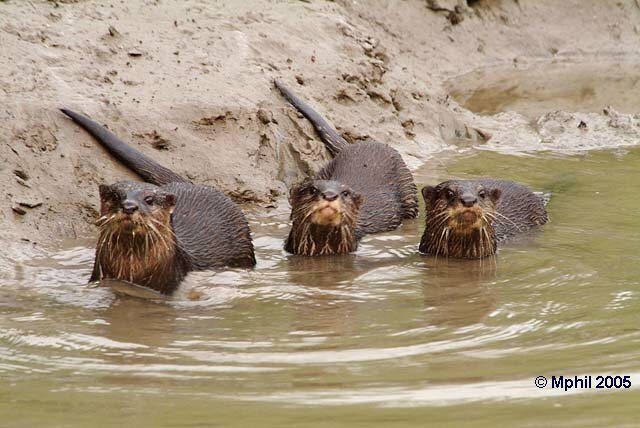 Like most burrowers, these otters will use old dens of other animals if they are suitable, but despite having tiny claws, they can build large underground burrows in riversides, often with one shaft leading up, possibly as a ventilation shaft, and the other opening about three feet underwater. They also use dense vegetation to lie up in and rest during the day. They gather dry grass, reeds and leaves to line the holt as bedding.